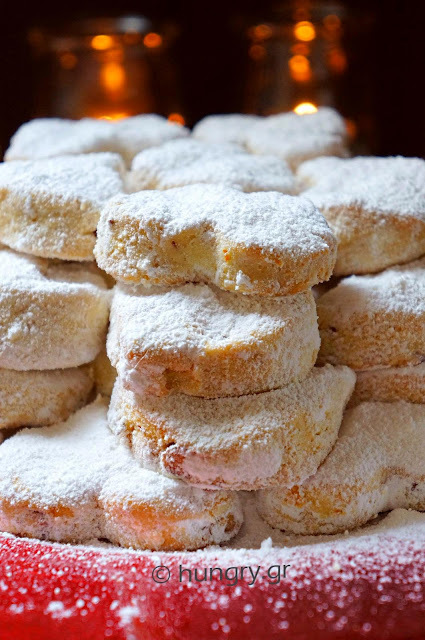 Crushable, plump, crisp and very delicious kourabiedes and bonus the ease with which they are made. 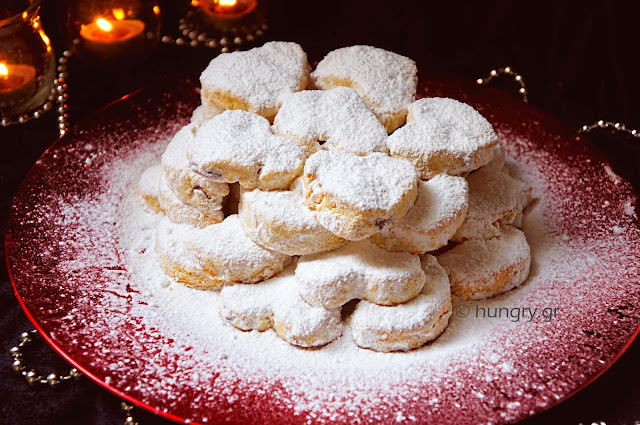 Demystification version kourabiedes, so because we like sometimes things done more easily and passable even for beginners kitchen… as if simply we make biscuits, biscuits/hearts, sprinkled with a white cloud of powdered sugar to resemble our snowy, festive scenery! 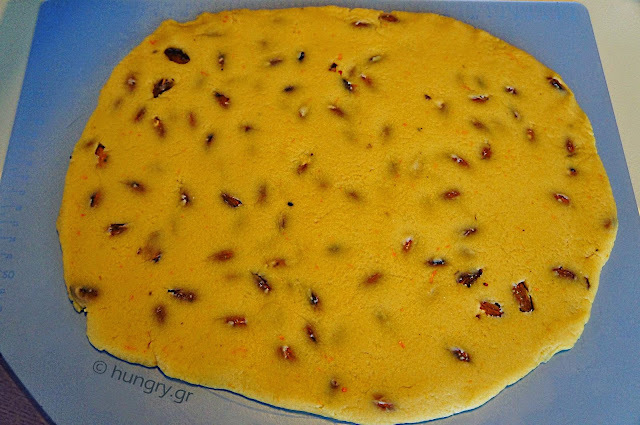 Good butter, powdered sugar, cognac and roasted almonds, to let the aroma of roasting and their taste in kourabie dough. That's all the essential ingredients all combined together give us a super tasty flavor. What a pity that you do not make them more often! 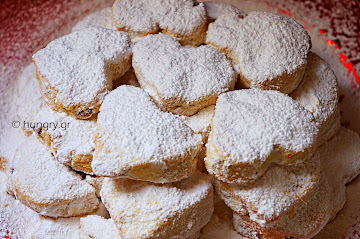 The kourabiedes, these exceptional flavor biscuits / cookies, started the sweet life in Persia in the 7th century, shortly after the use of sugar, and were relatively common in the region. Made with slight variations, except the Middle East, the Philippines, France, Spain (polvorón, -nes, which brought the Moors, probably Levantine origin, since they are based on a similar sweet known as ghurayba), in Latin America in Mexico, the United States and elsewhere. 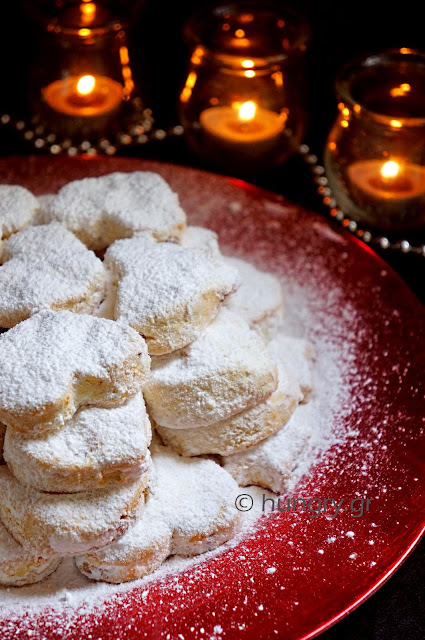 In some locations the Christmas kourabiedes are decorated with a whole clove pin, embedded in each piece. 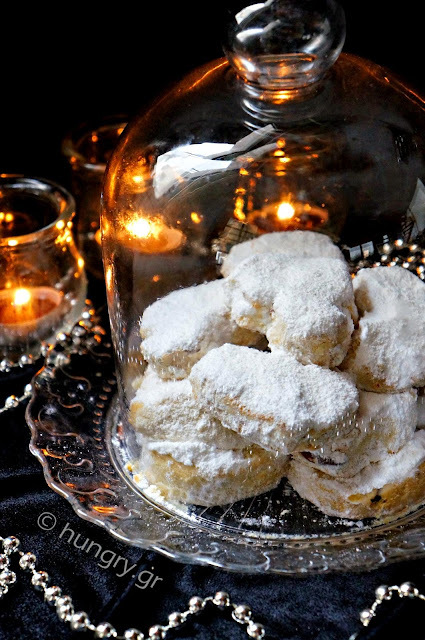 The kourabiedes are very popular for special occasions like Christmas or christenings. 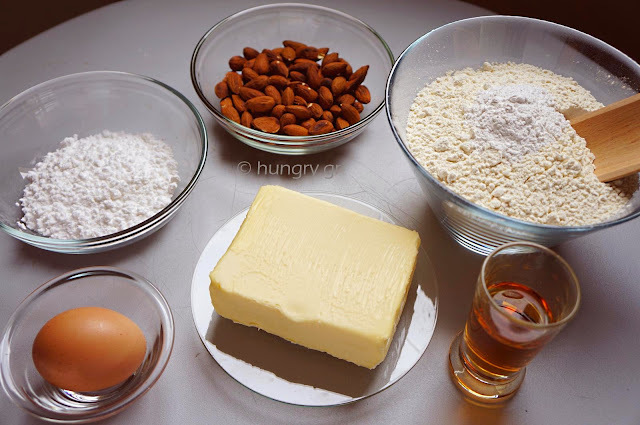 In the oven grill or frying pan, without fat, put the almonds and roast them carefully for a while. Let cool. 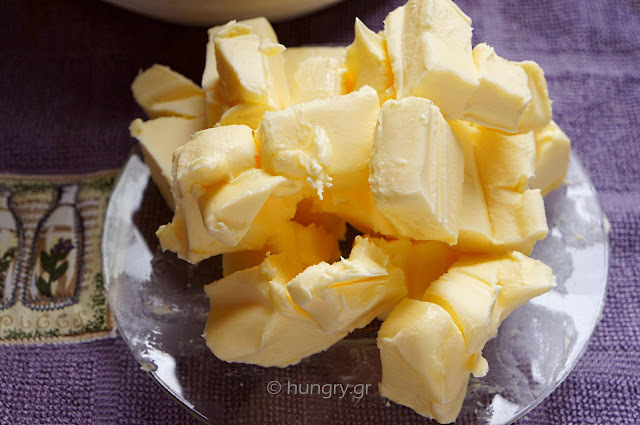 Chop the butter into cubes and set aside for a while. 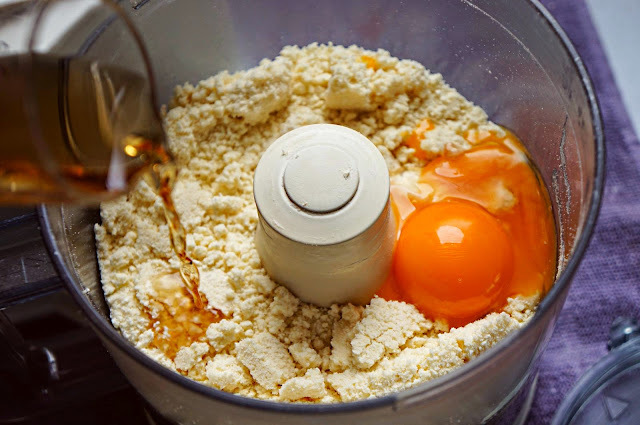 In the blender's bowl, add the flour, the baking powder, 50 gr of powdered sugar and butter. Put it into operation for 2'-3' to become a mixture of crumbs, to look like wet sand. Add the egg yolks, brandy and cloves. Beat for a while and transfer the mixture to a large bowl or desktop. Knead lightly. 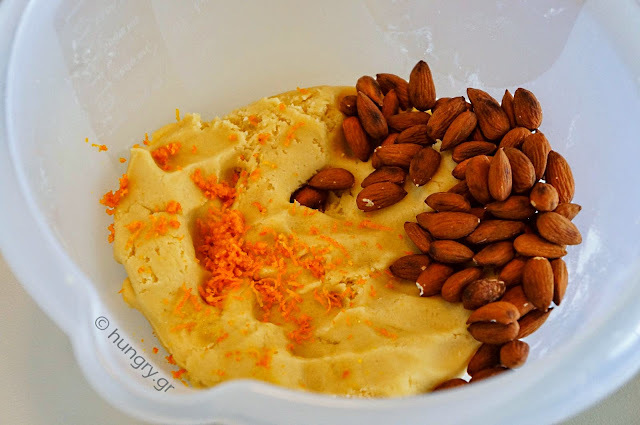 Add the orange zest and roasted almonds, whole or chopped. Knead the dough gently and very little until integrate the ingredients and have a silky dough, which will not stick in our hands. 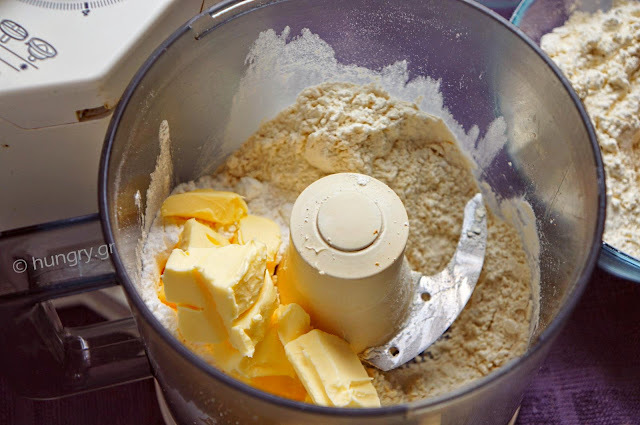 If necessary, put one or half a tablespoon flour, no more. 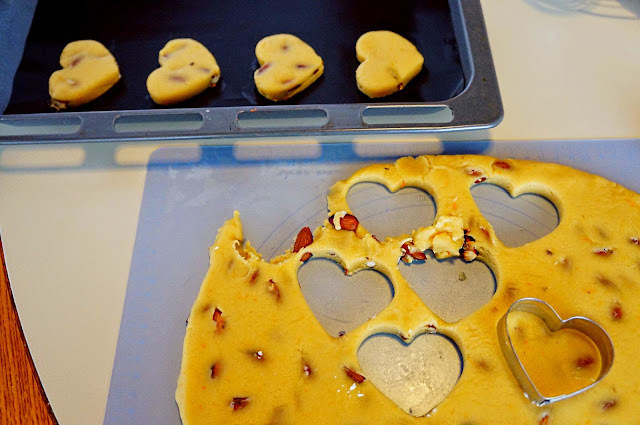 Roll out the dough into a flat, thick sheet of thickness 4-5mm (0.2 in). With a coupe-pâte, of whatever shape you want even with a small shot glass to become round, cut various shapes. They are about 2 pans. Depends on the size. As much dough is left over, collect it from cuts and reuse. Arrange them in a row and spaced a large oven dish, lined with greaseproof paper. Bake for 12' in a preheated oven at 200°C (392°F, Gas:5.7). When they start to golden on edges remove from the oven. 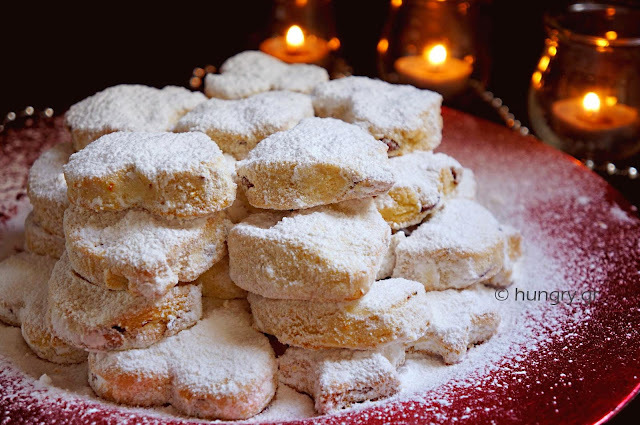 Pour in a wide pot a little powdered sugar, sifted, and put in the hot kourabiedes little by little and gently because when warm they are very fragile. Sprinkle over some more sugar. You decorate a platter. Some prefer them with walnut, so choose whichever nut you prefer according to your taste! 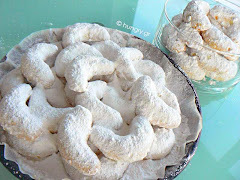 To make these kourabiedes is not necessary the electric mixer. 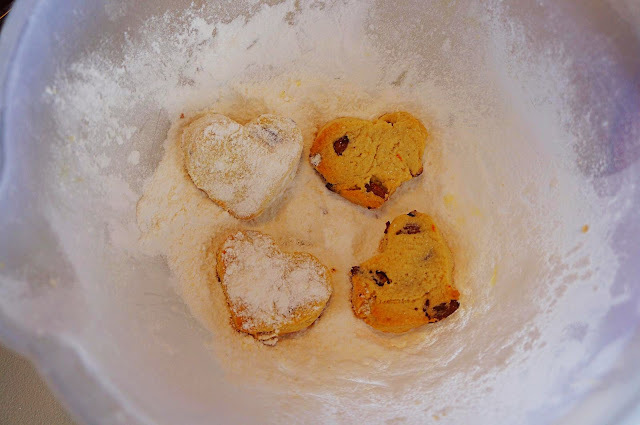 You can from the beginning to work their kneading with your hands, since they need neither special nor too much trouble. 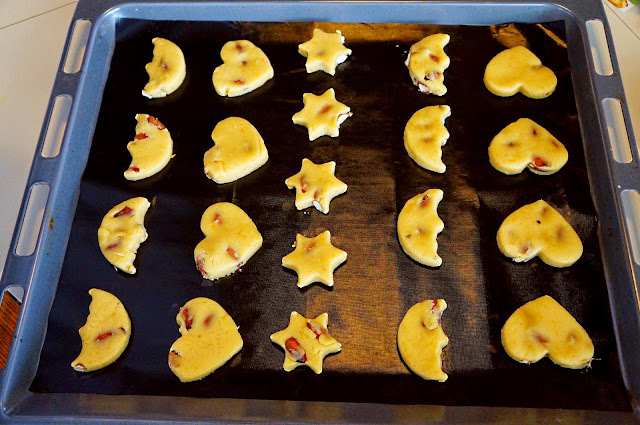 The sugared orange peels utilized to give the aroma and sweet taste of these delicious cookies. 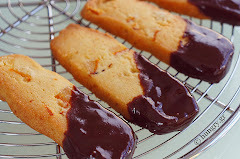 Cookies crumbled, slightly crunchy outside, and with the presence of orange combined with dark chocolate. A sweet from the old days. When even at urban homes and bakeries where saying them macarons. Ideal sweet, with delicate taste and subtle aromas of almonds and rose water. 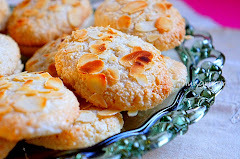 Favorite traditional almond cookies, sprinkled with almond flakes and stuffed with jam between them or plain.